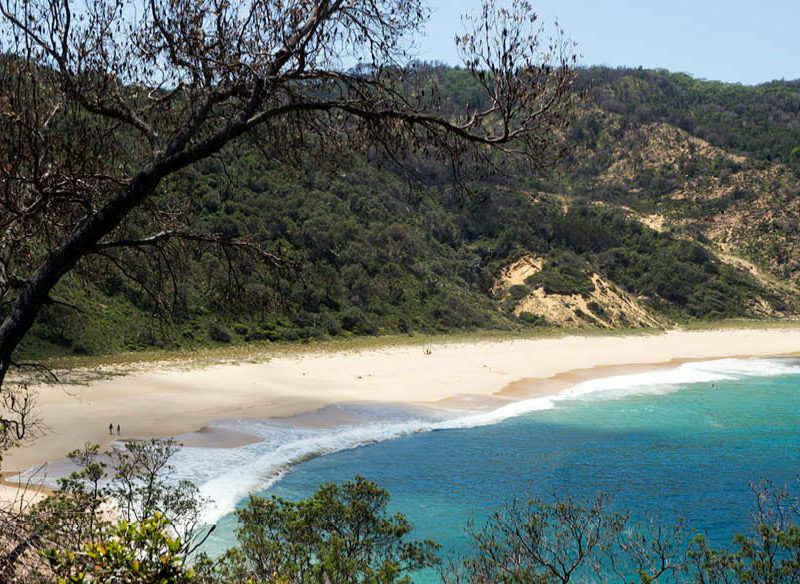 Hidden within the Booderee National Park , Steamers Beach is accessible only by a bush track. A quick break at the end of a busy week can do you a world of good, but planning one is often the last thing we have time for. Follow in the footsteps of Imogen Eveson as she shares her itinerary for a quick, easy and revitalising trip. I leave work in the city on a Friday evening and by 8.30pm I’m in the middle of the bush having dinner in the treetops. The next morning, I wake to the sound of the ocean and step onto my balcony to look out over a white-sand beach. By Sunday night I am back in Sydney, but in between I have taken a bushwalk to a secret bay; cooled off in the water; read a magazine with a glass of wine in hand; enjoyed a barbecue with family; and eaten a great lunch in a country town. By Monday morning, I’m feeling quite good. With turquoise waters and a quiet stretch of golden sand, Steamers Beach is worth the steep descent. For those city-dwellers among us who feel drained at the end of the week by late nights and snarled up commutes, a weekend away is the ultimate refresher. And luckily for us in Australia, we don’t have to travel far out of the city to find incredible natural surrounds and restorative solitude. However between social commitments and laundry to do, they’re often the last thing we make time for. But they shouldn’t be. Block out a weekend, make some bookings and jump in the car on a Friday night. Our mini-break took us to New South Wales’ gorgeous South Coast. And, if you’re in search of a little inspiration, here’s what we did. A forerunner in the luxury camping field, Paperbark Camp opened in 1998 and, while the secret is definitely out, it retains its magical and rarefied air. We ate dinner in the gorgeous Gunyah Restaurant and soaked in a little bit of that special something. We didn’t stay the night… this time. Whalers Cottage at Hyams Beach has everything you need in a beach house… ample coffee table books included. Instead, we checked into Whalers Cottage in Jervis Bay. A 90-year-old fisherman’s cottage with periwinkle blue-painted weatherboard, it has everything you could want from a beach house: renovated to a high standard, with plenty of space for lounging inside and out; a good selection of DVDs and games; and, crucially, just a few minutes’ barefoot walk to Hyams Beach. Our two-bedroom house forms part of a strip of similarly cute cottages including the one-bedroom Minke next door, available for hire via the same owner. We grabbed some coffee and breakfast at Hyams Beach Store and Cafe before setting out on a morning walk. Steamers Beach is a beautiful stretch of sand that you’ll find quite deserted even on a weekend. Located in Booderee National Park, it’s accessible only via a three-kilometre bush track and rocky (stepped) descent. The walk is not too arduous, but is enough to justify the leisurely dip in the ocean at Hyams Beach afterwards, and the generous pours of wine come evening. From Kangaroo Valley to Kiama, there are several places you can stop for lunch on the way back from Jervis Bay to Sydney. On Sunday, we opted for Berry and checked out the Berry Sourdough Cafe, where the creative menu changes regularly with the seasons. We chose from dishes like rigatoni with Spanish pork sausage, fish of the day and pizza made with the cafe’s namesake sourdough. And we didn’t forget to grab some takeaway pastries to keep us going for the rest of the journey. A weekend well spent – bring on the next one. Is the Eurobodalla Coast oyster the best in the world?